Decorating your home or office with sophistication is easy with these beautiful, Hanging flowers pot hanging planters from Green Garden. Add a touch of colour to exterior walls and fences with these pretty garden, balcony, ưall planters. Ideal to light up faded brick walls and monotonous courtyards with flowers, herbs or your favorite plants. Perfect for your deck, patio, front porch, balcony or inside your home making an attractive focal point on your balcony - Especially if you plant brightly coloured flowers. They are the ideal shape and size to create an eye-catching vibrant display of colour and also look good hanging from railings or garden fences. So, ideal if you have a bistro style garden, and perfect for bringing a splash of colour and wow factor to the balcony of your flat when filled with some beautiful plants. Not expensive but practical, Ideal gift for your parent, your friends as well as the people who love gardening so much. So, please take care of your potted plant now and begin your new day! Suitable for planting varies Garden Plants, Flowers, Ferns, Herbs, Strawberry, Tomatoes and Succulent Plants. - Green Garden 100% Satisfaction Guarantee - Free Return & Exchange within 90-day. Click ‘Add to Cart’ to get these beautiful, hanging flowers pot and keep your pots hanging where you can enjoy their flowers, blooms, and colors. Ideal to light up dense brick fence walls and monotonous gardens with flowers, herbs or your favorite plants. Perfect for courtyard, patio, front porch, balcony, garden or indoors making attractive spot on the balcony. Special design: There is a built-in belt that can be hung on the balcony, window, balustrade, anywhere in the room, as well as outdoors. There are drain holes below to remove excess water. Size: Diameter 18.5 cm (7.3 inches), bottom diameter 10 cm (3.9 inches), height 15 cm (5.9 inches). Material: PP plastic flower pot, safe and non-toxic. 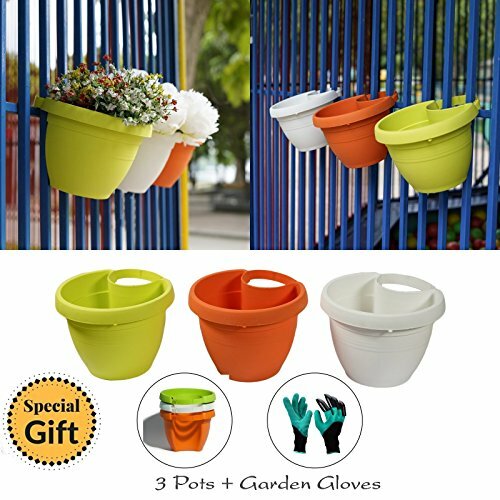 100% SATISFACTION GUARANTEE - Hanging planter is backed up with 90 day money back guarantee so that you can shop with confidence.